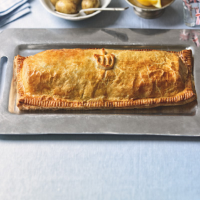 Jubilee salmon, conceived and created by a panel of the country’s top foodies to honour the Queen’s 60-year reign, is simple to make and delicious to eat. This recipe, by Jason Atherton, Fiona Cairns, Jeremy Lee and Allegra McEvedy, features a classic combination of salmon, fresh peas, dill and salad onions, and is one to rival Constance Spry’s coronation chicken, invented in 1953. 1. Preheat the oven to 200°C, gas mark 6; place a large baking sheet in the oven to heat up. In a pan of boiling water, blanch the peas for 1 minute; refresh under cold running water and set aside. Meanwhile, warm the butter in a pan. When foaming, add the salad onions and sauté gently for 5 minutes. 2. Put the peas in a food processor and pulse briefly until roughly chopped. Transfer to a bowl and stir in the salad onions, ginger, dill and lemon juice; season well and set aside. 3. Roll out both blocks of pastry to roughly 20cm x 45cm. Lay one piece of pastry on a large piece of baking parchment and brush the border with beaten egg. Place one salmon fillet in the centre of the pastry, season, then cover with the pea mixture. the top. Brush all over with the beaten egg, transfer to the hot baking sheet and bake in the oven for 25–30 minutes until golden. 5. For the dressing, put the eggs in a pan of cold water and bring to the boil. Simmer for 8 minutes; remove, then cool under cold running water. Peel the eggs, remove the yolks and place these in the small bowl of a food processor. Chop the whites and set aside. 6. Add the mustard to the yolks, then with the motor running, slowly pour in the olive oil until combined and emulsified like a mayonnaise. Add the vinegar and blitz once more before transferring to a bowl. Stir in the capers, herbs and chopped egg whites; season. 7. Allow the salmon to cool for 5–10 minutes before cutting into slices and serving with the lemon wedges, egg and caper dressing and some hot buttered Jersey royals and asparagus, if liked.